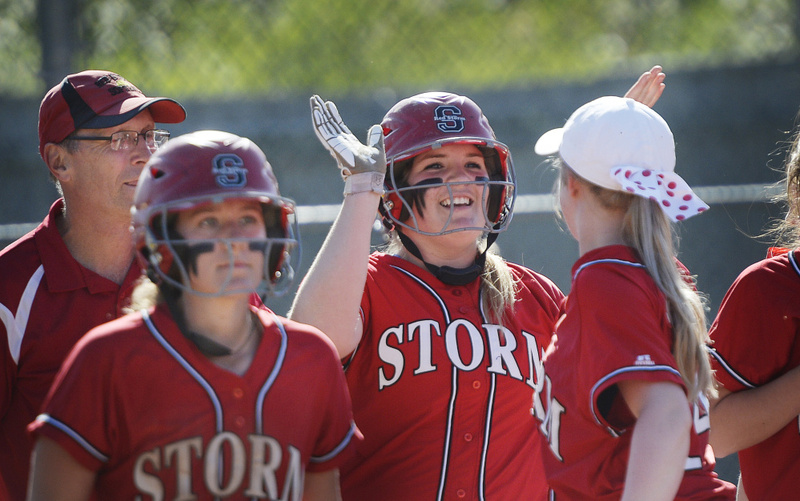 Abbie Murrell drives in five runs and pitches the Red Storm to a 15-0 victory over the Eagles. WINDHAM — This was the game everyone in Class A South was waiting for – especially, it seems, the players and coaches at perennial softball power Scarborough High. In a showdown between unbeaten teams Tuesday, the Red Storm left little doubt that the gap between them and the rest of the region is still pretty significant. With Abbie Murrell pitching and hitting, Scarborough routed Windham 15-0 in a game stopped after five innings because of softball’s 12-run rule. Murrell allowed one hit in four innings, and drove in five runs with a homer and two singles. “I’m just really pleased with the way my kids responded today. They were ready,” said Scarborough Coach Tom Griffin. “This was a good opportunity to see what we have. Scarborough (10-0) has pretty much dominated everyone this season, outscoring opponents 137-4. Windham (10-1) had scored 148 runs coming in. “We wanted to separate ourselves from everybody else,” said Murrell. The Red Storm scored three times in the first inning and the Eagles (10-1) never recovered. It was a tough first inning for Windham, which allowed an infield pop-up to drop untouched next to the pitcher’s circle and let in another run while throwing the ball around the infield to try to get a Scarborough runner who was already out. Scarborough broke it open with a 10-run third inning, sending 15 batters to the plate. After a walk and a single to open it, Murrell hit a line-drive home run that cleared the left-field fence in about two seconds. By the end of the top of the third, Courtney Brochu and Bella Dickinson had RBI singles, Powell drew a bases-loaded walk and Murrell hit a scorching RBI single that ricocheted off the chest of a Windham infielder, allowing another runner to score as the ball rolled away. Two other runs came in on an error. While pitching, Murrell allowed only a double by Olivia Mora in the fourth and struck out five. As good as the Red Storm played against the Eagles, they expect more.